Directions : From Joshua Tree on 29 Palms Hwy, turn left(north) on Sunburst. Go to Golden. Turn right(east). Go to Border. Turn left(north). Go to Saturn. Turn left(west). Go to Adele - no sign, use GPS. Turn right(north). Go to next intersection - Mercury. Turn left(north). Go 100 ft, immediately past an artistically painted container, turn left into driveway. Remarks : This is a rare find. 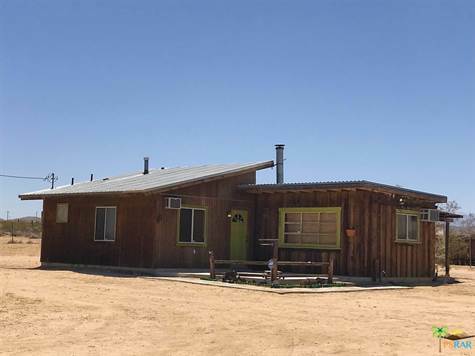 A beautifully renovated cabin in highly desirable Joshua Tree. Include the furnishings in your offer for a turn-key home from home! Only 15 minutes from downtown Joshua Tree Village, and 20 minutes from the Park entrance. No light pollution, nothing but peace and quiet and the stars. A large portion of the lot is fenced for dogs and kids to run around. A big wood stove and A/C. Water is delivered. Come check out the endless views from the back porch. This is the perfect spot to kick back and unwind.